The spiritual awakening comes to the seeker, who is perfectly humble and "meek" and "poor in spirit." The quality of true humility is one of the indispensable fundamentals. Then we find simplicity, holiness and the renunciation of all desire for worldly wealth and pride of learning. Christmas celebration of the year 2009 will surely be one to remember for the communities of Alaba-Rago and Agege home for the needy, Lagos State, Nigeria. Not much is known of these communities. However, they both have something in common: slum occupied by the poor. It was on this day that Prophet TB Joshua of the Synagogue Church of All Nations and the Emmanuel TV team paid a visit to the inhabitants of these communities. The primary aim of the visit was to preach the Gospel of Jesus Christ. In addition, the occasion served as an opportunity to carry out the act of charity and giving. Prophet TB Joshua accompanied by The Emmanuel TV team, stormed Alaba-Rago with a truck-full of top quality rice. This rice is intended only for the deprived/underprivileged that reside in the community. The sight of the environment was appalling, to say the least. One had to wonder how the inhabitants manage to survive in such an environment unbefitting of a human being. At a point, the Prophet approached a young man smoking marijuana, collected it from him and extinguished it on his jeans. He then spotted a hut full of young men. He entered and discovered that they were all puffing away at their marijuana. Surprisingly, he sat in their midst and started a conversation with them, telling them that he was their friend. The hut was practically jam-packed, with each person with the exception of Prophet TB Joshua holding a stick of marijuana. Prophet TB Joshua shared the Gospel of Jesus Christ with them and promised to assist any one of them that decided to further their education or take up a trade. He then donated bags of rice to them. 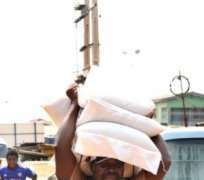 At the Agege home for the needy, Prophet TB Joshsua wa seen lifting bags of rice on his head. He also donated loads of bag of rice to the blind and leper community. In addition, the sum of N300,000 was presented to the leader of the community. All the fruits of the Spirit which we are to lay weight upon as evidential of grace, are summed up in charity, or Christian love; because this is the sum of all grace. And the only way, therefore, in which anyone can know their good estate, is by discerning the exercises of this divine charity in their hearts; for without charity, let men have what gifts you please, they are nothing.